Description of "Corporate Social Responsibility"
The real success of Indian democracy is being attributed to its social responsiveness towards all of its citizens. Nevertheless, in the endeavour of sustaining a true and vibrant democracy, the country strives very hard to extent the facilities and benefits to all strata of the society due to its constrained resources. Therefore, the Government of India needs a helping hand from corporate sector to ensure better standard of living of its people. In this regard, the corporate India is expected to play a constructive role by undertaking activities which may ultimately lead to social rejuvenation, development and empowerment of unprivileged people. If this happens, India is very proud to be one of the countries in the world to attain real inclusive growth. Hence, it is felt that Corporate Social Responsibility (CSR) activities of companies are really a key to unlock both economic and social disparities, which in turn, benefits the person in the last mile. Moreover, the Companies Act, 2013 has directed corporate India to work towards a growth based socio-economic-environment development model. The present book is an attempt to provide the emerging trends and best practices in CSR implementation, models of partnership, managerial and organizational challenges and issues in monitoring and evaluation of projects related to CSR in the public and private sector. I thank all paper contributors for their continued support, encouragement, inspiration to complete this task. Without their help it will be difficult task for me to complete this volume. Dr. M. Vasan, M. Com., M.B.A., M.Phil.., Ph. D. is Head, in the PG and Research Department of Commerce, K.S. Rangasamy College of Arts & Science (Autonomous), Tiruchengode. He specializes in the areas of Accounting, Marketing and Human Resource Management. He has actively participated and presented research papers in 38 international/national seminars and participated in 10 workshops. He published 26 research papers in journals of international and national repute. He has penned 3 books in the area of commerce and management. He is guiding M. Phil., and Ph. D Scholars of Periyar University, Salem. He is a life member of the Indian Accounting Association and Indian Commerce Association. 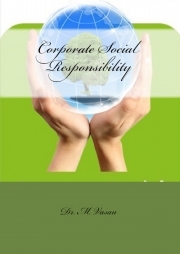 Reviews of "Corporate Social Responsibility"